On April 4th, Bloomberg reported that HSBC (HSBC) is considering an exit or sale from smaller consumer operations such as Bermuda, Malta, and Uruguay. In addition, the bank plans to expand its asset management division and is currently looking at a potential merger with a rival. In our view, the news confirms that the group’s management will remain committed to transforming HSBC into a more focused and more efficient banking institution. More importantly, even though HSBC’s operations in Bermuda, Malta, and Uruguay are small compared to the group’s total assets, we believe a potential sale of these units would have a positive impact on the bank’s capital position, supporting stock buybacks and special dividends. LIBOR has grown by more than 130bps since the beginning of the year. Such a notable increase is currently among the most widely discussed topics. Several analysts suggest that this is an early indicator of a bear market or even a severe financial crisis. In our view, the increase has been driven by idiosyncratic reasons, in particular, higher supply of short-term Treasuries and lower demand from corporates due to the US tax reform. With that being said, despite the reasons of the rise in LIBOR, HSBC should benefit from higher short-term rates. As shown below, the bank discloses its NII (net interest income) sensitivity to a shift in yield curves. However, this analysis is based on a parallel shift, while yield curves in most global economies continue to flatten. What is important here is that HSBC has a variable-rate loan book. More importantly, a significant part of its credit portfolio is priced off short-term rates. This suggests to us that the rise in LIBOR should be a positive for the bank’s asset yields and its NIM. One may argue that higher short-term rates will also affect HSBC’s funding costs, especially given that wholesale sources and corporate deposits are generally tied to the short-end of the yield curve. The caveat here is that HSBC has a unique funding position. 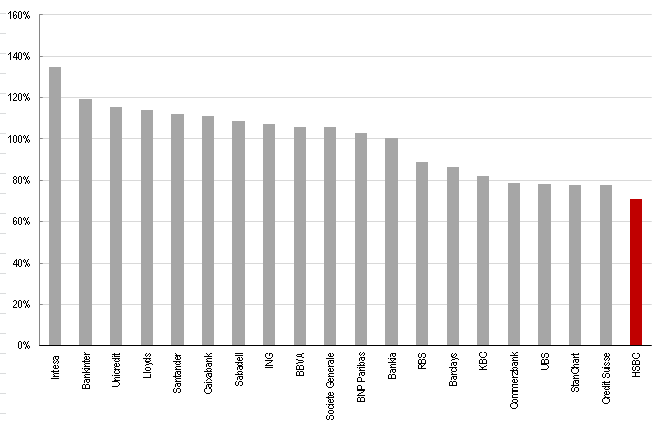 As shown below, the bank has one of the lowest LtD (loans-to-deposits) ratios among European banks. In other words, HSBC does not need expensive deposits in order to fund its loan growth. HSBC had been struggling from abundant liquidity for many years as a low interest rate environment has virtually crippled its NIM. Given that rates have started rising, the bank’s excessive liquidity is gradually turning into a positive that will protect HSBC’s NIM in a rising interest rate environment. Saudi Aramco (Private:ARMCO) has appointed HSBC as an adviser on its much-awaited IPO. JPMorgan (JPM) and Morgan Stanley (MS) will also act as consultants. As such, HSBC is the only non-US bank that will have a crucial role in Aramco’s IPO. Anecdotal evidence suggests that while many US and UK investors are skeptical on Saudi Aramco’s IPO, as state-owned oil companies have been underperforming their private peers for quite a while now, Chinese investors would be interested in Aramco’s shares. Hong Kong Exchanges and Clearing (OTCPK:HKXCF) (OTCPK:HKXCY) plans to introduce the so-called Primary Connect program, which would allow mainland Chinese investors to participate in initial public offerings on the HKEX. We believe Aramco’s IPO would strengthen HSBC’s position in the region. In our view, it would also underpin the fact that HSBC is a global banking group with unique access to Chinese investors. HSBC pays a $ 0.51 dividend per ordinary share or $ 2.55 per ADR. That corresponds to a 5.4% dividend yield, based on the current ADR price. We believe that a 5.4% dividend from a global blue-chip bank with a strong presence on Asian markets looks very attractive. Additionally, it is also worth noting that the bank has temporarily suspended its buyback program due to technical reasons related to the issuance of additional Tier 1 capital. We expect HSBC to announce a new buyback in the second half of 2018. The shares have fallen by almost 15% since January, and we believe this sell-off represents a great opportunity to buy a global bank with an attractive dividend yield. HSBC has excess capital, thanks to its US unit, and, as a result, we expect the bank to announce a new buyback program in the second half of the year. If you would like to receive our articles as soon as they are published, consider following us by clicking the “Follow” button beside our name at the top of the page. Thank you for reading. Disclosure: I am/we are long HSBC, JPM.